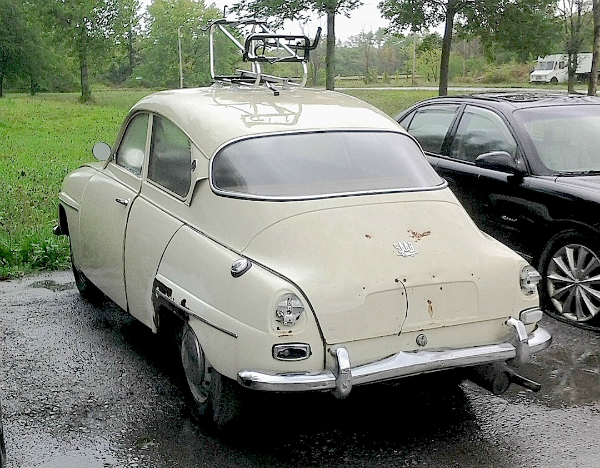 There may be a few bits missing (that we can see) on this 1967 Saab 96, but otherwise it looks very restorable. These things were pretty indestructible back in the day, and were winners of many international road rallies (the front-wheel-drive certainly didn’t hurt, nor did their nimble size). Looks weren’t high on the list when these Saabs were being designed, but no one seemed to care much. The brochure even tells us: “Solid citizens do not choose a Saab sedan because it is the handsomest car available. It is better looking than ever (We love it!). But Saab owners don’t judge this car by its looks. They love it for its engineering!” Amen. Saw this one over the summer in Youngstown. Jim Corbran, RRofWNY …and check out our Facebook page: Non-American Classic Cars The post RealRides Of WNY appeared first on Buffalo Cars.